Here you will find Maya artifacts just the way they were left by the Mayas hundreds of years ago. 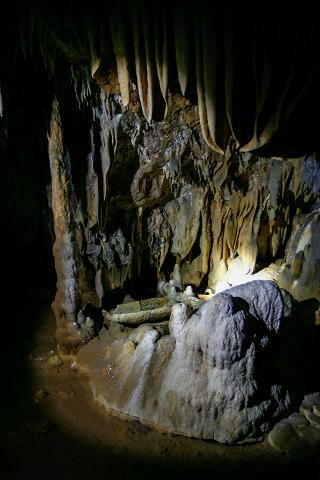 The cave is ranked as one of the Top Ten Caves Of The World by the National Geographic Society. National Geographic and the Discovery Channels and History have done documentaries on this spectacular cave. 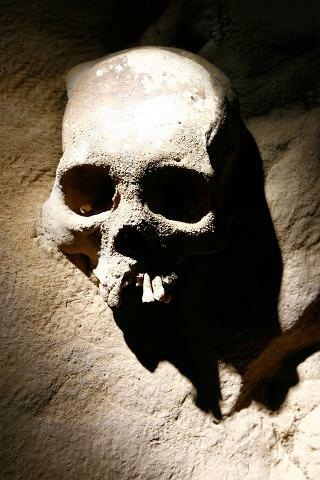 Allow us to unveil the secrets of “Xibalba” the Mayan underworld to you. 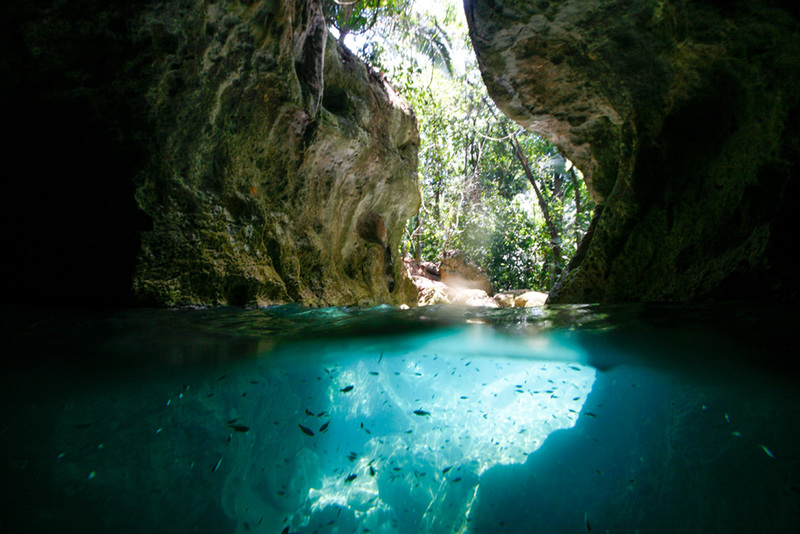 The Mayas consider Actun Tunichil Muknal a highly sacred location, enclosing the famous “Crystal Maiden” who was thought to be the sacrifice victim. 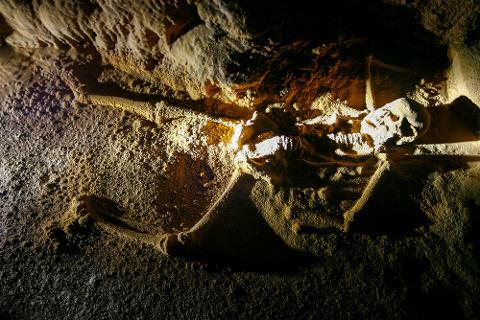 After decades of weathering and natural processes, the surface of the skeleton appears to be covered with a geological sanded finish, which gives the maiden a somewhat magical fairy-dust appearance. Getting There: Your adventure begins at 8:00 AM with a 45 minutes’ drive on the George Price Highway towards the junction at Teakettle village where, for another 30 minutes’, we drive on a dirt road until reaching the site’s parking lot. From the parking lot, we then venture into a 45 minutes’ jungle hike toward the cave entrance, crossing a knees-deep river 3 times along the way- enjoy the scenery. At the cave entrance: Upon reaching the mouth of the ATM cave, your guide briefs you on the cave’s historical facts while we gear up with helmets and head lamps. The hike inside the cave entails a very short swims of about 30 feet across at the very entrance of the cave. 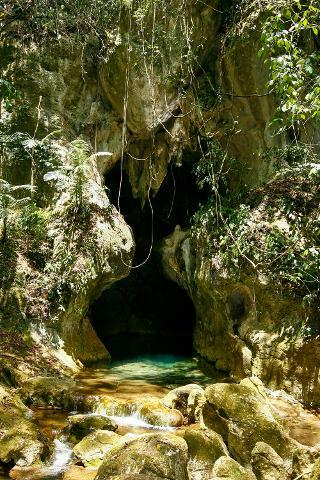 For non-swimmers, there is a by-pass around the corner of the cave’s entrance through which you are assisted by the guide. This should not pose an issue since none-swimmers are equipped with life jackets. For the rest of the cave length, it’s mostly wading through the water no deeper than chest-height (at average height) at most. Admire the myriad cave formations along the way until reaching the hidden dry chamber where amazement awaits you. In the main chamber: To get to the dry chamber, we must climb over some rocks providing a staircase to the chamber. Once in the chamber, you’ll be asked by your guide to take off your shoes, and walk with only your socks on your feet. Here your guide explains the Maya rituals while you awe at the magnificence of this ancient tomb and its grandeur. 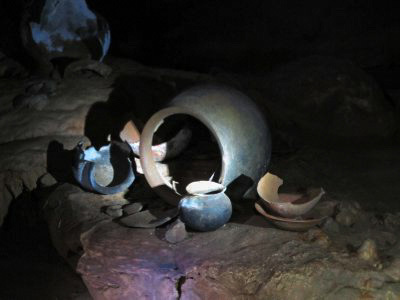 You’ll be amazed by all the Mayan artifacts and remains freely scattered throughout the cave as your guide explains how they got their and what lead to this shocking massacre in such a remote location. Walking farther into the cave, we’ll reach a higher but smaller chamber accessible only through the use of a man-made ladder. This is where the prized, intact, crystalized skeletal remains of the Crystal Maiden lay. Take your time, to sink in the reality of what lies before you. Departure: After being saturated to capacity with astonishment, we make our way back out of the chambers and the cave. (the way back out always seems so much shorter than the way in). We then hike back onto the parking lot, where the guide will provide you with your lunch as you discuss the reality of what you’ve just witnessed inside. You may choose to change into your dry clothes before or after lunch (your choice). After lunch, we board our vehicle and head back to San Ignacio arriving around 3:30- 4:00 PM. What not to bring: Cameras are not allowed inside the cave (you may use them along the trail leading the to cave), don’t bring along any jewelry or cell phones, if you wear glasses, please wear it using a strap. Provided: Helmets, headlamps, towels, and life vests are provided. You have the option of not wearing life vests for comfort If you are a confident swimmer. The guide will carry a dry bag where you can keep all your belongings dry and safe. Note: This tour is not for persons with disabilities, heart conditions, back or leg problems, or claustrophobia. All guests must be in good physical conditions & able to walk in a jungle setting and in water. The ability to hike for 4+ hours and be comfortable with small spaces is important.